Beyond the Internet: Week 3: Houses wrapped in red tape. Don’t you find life is full of red tape? Someone always wants paperwork from you in relation to some part of your life. How do people survive who are uneducated I wonder. The very same red tape that we often find so exasperating in day-to-day life, is heaven-sent when we’re doing family history. Much of it is found wrapped in brown paper tied with a pink ribbon, in an archive near you. Relatively speaking little of it is available on the internet. The Beyond the Internet series is intended to highlight some of the sources you may not have thought about and which will flesh out your family stories. 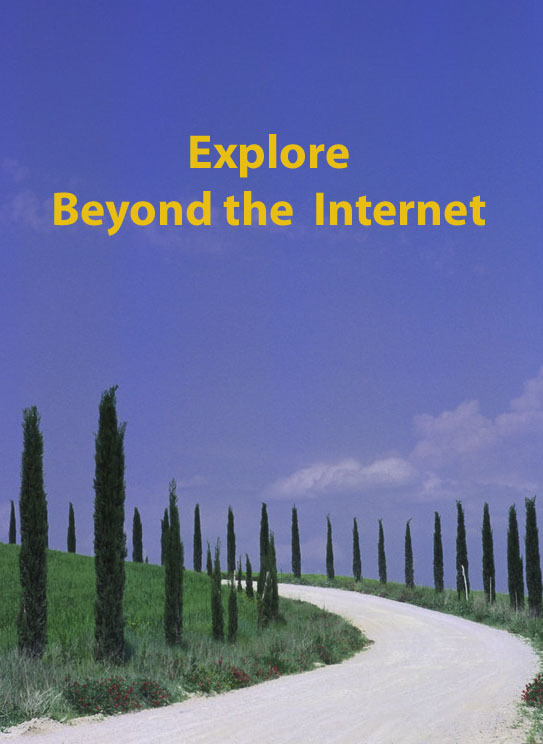 I’ve put a graphic on this page to represent our exploration Beyond the Internet. The unedited version was a free clipart from Microsoft Office so I think there are no copyright issues. 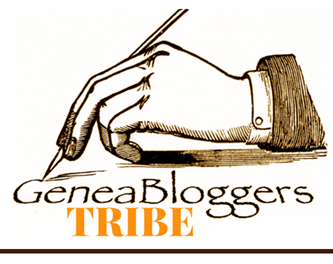 Feel free to put it on your blog page if you want to join in and post to any of these topics…the more the merrier. It would be great too if there was representation from different regions and countries. Land titles documents are available from the State lands department (its name will vary depending on place and government but in Queensland is currently the Department of Environment and Resource Management). Yes, they are not free but they can also be very useful and the money well spent. On a recent trip interstate I purchased two certificates of title for my grandparents’ property. [i] No one really knew when Grandad bought the land and built the house but these documents solved part of that mystery. The first certificate, dated 5 September 1917, showed my grandfather’s purchase of plot 31 from a David McMullen who’d bought it only a few months earlier from a James Taylor Searle. These transfers were around the time the subdivision took place. This purchase date was only a month before Grandad enlisted to serve in WWI, which tells me he was setting something aside either for his betrothed (if they were actually engaged) or his younger siblings in case he was killed. My grandfather was a steady, considered man so I have little doubt this was a planned strategy…it would be so interesting to see his military will. He’d been the eldest child when both his parents died so no doubt that impacted on his life attitudes. A few months later the title on the adjoining plots 30 and 31 were transferred to Susan Ann Easey on 23 January 1918. But it doesn’t end there. On his return from the war my grandfather purchased plots 30 and 31 from Susan Ann Easey, stated to be the wife of Arthur Edwin Easey on 21 January 1921. Oral history also tells us that Mrs Easey is the woman with whom Grandad boarded his youngest brother after their parents’ died. Mrs Easey appears on the electoral rolls but interestingly not at this address. My grandparents married in 1922 so my best guess at present is that the house was built between 1921 and his marriage. The house currently sits close-ish to the boundary between plots 30 and 31 but my mother told me recently that my grandparents’ house was moved a couple of metres when my parents’ house was built after their marriage. Hence my hypothesis is that Grandad built the house after he had purchased all three blocks and between January 1921 and April 1922. Another snippet on the Certificate of Title has given me a further clue to explore when next at the Archives. His will, through the Public Curator of Queensland, was dated 15 January 1948 and as they acted as “devisee in trust”, I’m assuming the house had been left to my father but for my grandmother to have residence until her death. 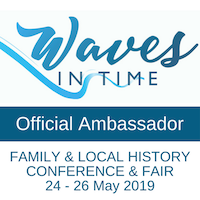 I do find land records quite confusing and for New South Wales records some years ago I used a record agent to dig out the many land files for one of my ancestors. I figured it was probably worth my while and would be more efficient than me trying to get to the bottom of it all during brief interstate trips. Even though Council rates are local government records many historic records are held at the Queensland State Archives (other states may be different and I can’t speak for that). There may also be copies held in the relevant town. After the establishment of Ipswich as a municipality, many of my ancestors appear in the records for that town’s rate payments. So what does this tell us? The value of the property relative to those nearby will give you an idea of the standard of their house. There may be maps which correlate to the land allotments allowing you to be absolutely certain where their house or business was located. This will enable you to compare that with current maps or to pinpoint the location during a site visit. As rates are paid on all properties owned you may discover that your ancestors owned more than one property – something which doesn’t become clear from Post Office directories or electoral rolls, which are most likely to focus only on their residential property. I also made an interesting discovery that one of my ancestors changed his first name when he moved towns, probably because of a problem with the law. It makes you wonder how he came to revert to his original name and what people’s responses to that were in a small town…or was it only on the rate books that his name was different. Rate books will also give you an insight into the area –the type of housing, the area’s expansion etc. It’s important to investigate where these sources are located. 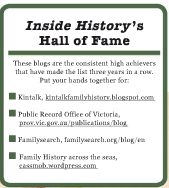 I’ve found them in the Queensland State Archives (my main haunt), local history libraries and Sydney City Archives (thanks to a tip-off from a genie-colleague). You may even find clues to assist your search you on the local real estate pages (yes, online I know!). I’d never heard of these records until alerted to them by Susie Zada at a talk in 2011. She’s also published a helpful little booklet through Unlock the Past, called Sewerage Records: an untapped magnificent resource. I can recommend it highly. I followed Susie’s tip and obtained the sewerage maps for my grandparents’ and parents’ street. The map shows all the buildings at the time, their location on the block and you will see where there were outhouses (dunnies/toilets) before the sewerage was installed. One of the early houses in the area 1878. State Library of Queensland Negative 153648. Image out of copyright. Early survey maps are so useful for learning more about the area where your ancestors lived. I look at them at the archives and the most important ones I purchase. Another source might be your Lands Department, especially if they have an historical library or such. Recently I obtained early maps of my grandparents’ and parents’ suburb (not urgent before because I was familiar with it from growing up there – or so I thought). 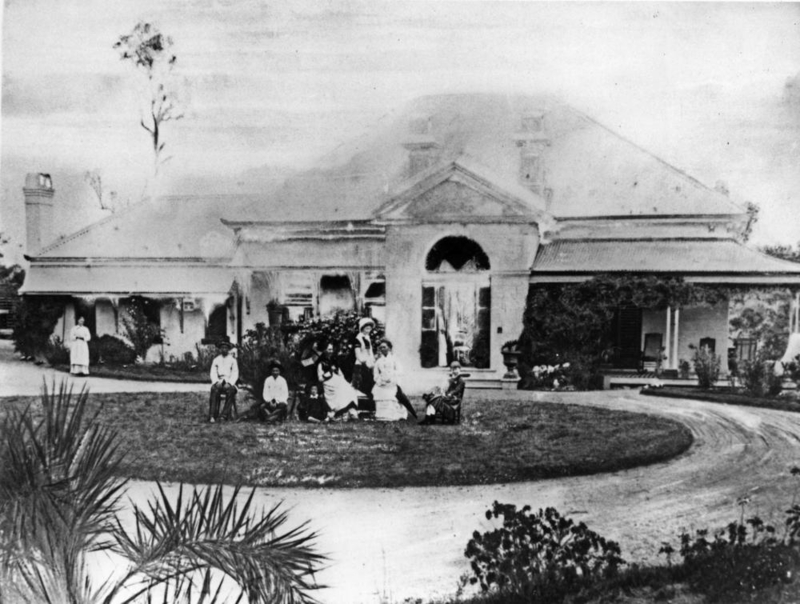 The maps show where the early landed “estates” were: properties with grander houses some featured on Picture Queensland. It shows a water reserve in a dip in the hilly street which my father called Frog’s Hollow (apt I think) and where there’s currently a house on the market for about $800,000. Reserves are set aside for schools and public recreation. Comparing these maps with stories published in the local newspaper (available online at Trove), brings the area to life. Each map reveals slightly different features including one showing the hilliness of the area. The names of some previously unknown homes will let me link them to the owners I researched through the electoral rolls. These Beyond the Internet resources are, as so often, just the tip of the iceberg. I’d love to hear of other sources people have used to learn more about their ancestral homes. [i] Certificates of title number 2228334 volume S 1319 folio 74 and 243499 Volume S 1387 and folio 239.